In World of Warcraft, Children's Week comes every spring. During this time, the forces of both Horde and Alliance are encouraged to give a little back to their respective communities by temporarily adopting an orphan. This babysitting is well worth the time, as it allows players to collect more pets! 1. What is Children's Week? All orphans wish they had someone to show them the wonders of the world. Throughout the year, they spend their time wandering around their home cities of Stormwind or Orgrimmar, dreaming of the day they'll be old enough (and big enough) to venture out into the world alone and see the sights their parents would have shown them. During Children's Week, though, brave adventurers for the Horde and the Alliance can make these kids' dreams come true! The reward for helping the orphans of various cities is access to several rare companion pets. These pets can only be obtained during this annual event, so don't miss out! There are eight Children's Week minipets available as quest rewards. Players can choose one of four companions for completing each series of quests in Azeroth and Outland, and one of two companions at the start of the Northrend quest line. Children's Week in World of Warcraft occurs at the beginning of May (usually between May 1st and May 8th). What quests are available during Children's Week? There's a series of quests in Azeroth (Stormwind for the Alliance and Orgrimmar for the Horde) available to characters level 10 and up. For those with the Burning Crusade expansion, there is also a series of quests available for both factions in Shattrath City (which is found in northwestern Terokkar Forest). These quests are available to characters who are level 60 and up. Finally, there are two quest chains available in Northrend for players with the Wrath of the Lich King expansion. These Northrend chains are avialable to horde and alliance, although only one chain may be completed per year. All of these quests involve taking an orphan to various points of interest. No combat is necessary, except perhaps when making your way each location. When you accept the first quest of each chain, you'll receive an [Orphan Whistle]. Use this whistle to summon your orphan. Note that an orphan acts just like a companion pet. An orphan will take the place of any currently summoned companion. They cannot be attacked or killed. Additionally, orphans will follow their caregivers on foot, regardless of speed. If I did the Children's Week quests last year, will I be able to do them again this year? Every event has always offered repeatable content. Therefore, you will be able to do the chain again this year, allowing you to collect a different pet than you chose last year. You can also repeat the quests again next year, giving you access to yet another pet at that time. Can I complete the Azeroth quests, the Outland quests, and the Northrend quests? What level should I be to safely complete the Outland quests? The initial quest becomes available at 60. Those who are below 62 may have an easier time traveling in a group. Characters that are 62+ should have little trouble soloing the quests. What level should I be to safely complete the Northrend quests? The initial quest becomes available at 70. Those who are below 72 may have an easier time traveling in a group. Characters that are 72+ should have little trouble soloing the quests. Can I do the Wolvar quests if I'm currently allied with the Oracles, and vice-versa? Yes. Your current standing with The Oracles and The Frenzyheart Tribe has no bearing on the Northrend orphan quests. How long will the quests take to complete? Each series of quests typically take about an hour to complete (even less time using if using portals). Before you embark upon this quest chain, you may wish to toggle your hearthstone to a Stormwind City inn. Doing so will allow you to quickly return to Stormwind to complete the final quests in the series. TIP: Mages make excellent traveling companions for completing these quests. Their ability to portal allows them to complete the quests in roughly half the time. You'd do well to join up with a mage if you can. To begin this series, go to Stormwind City and accept the quest Children's Week (level 10+) offered by Orphan Matron Nightingale (map below). You will receive a [Human Orphan Whistle]. Use the [Human Orphan Whistle] to summon your orphan. Talk to the orphan to complete the quest. Completing this quest will unlock the next three quests in the series. Accept all three. 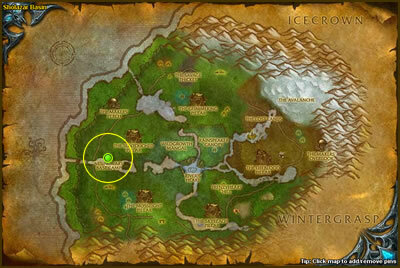 First, fly to Sentinel Hill in Westfall (map below). Summon your orphan to join you on a joyride around the Westfall Chasm to complete the quest Cruisin' the Chasm. Be sure you receive credit before you leave the area. When finished in Westfall, return to Stormwind City. 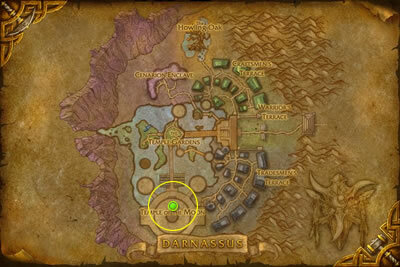 From Stormwind, hit the docks and head to Darnassus. 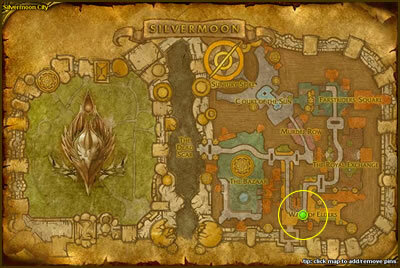 Then go to the Temple of the Moon to see Malfurion Stormrage (map below). Summon your orphan to complete the quest Malfurion Has Returned! Be sure you receive credit before you leave the area. Next, return to Stormind and take the Deep Run Tram to Ironforge. 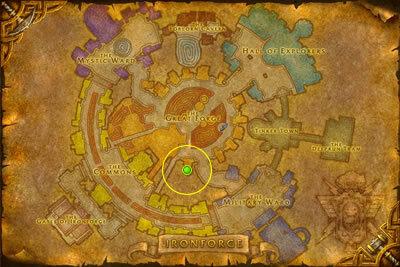 At the entrance to the throne room, bear left and enter the Hall of Thanes (map below) in Old Ironforge. Summon your orphan to complete the quest The Biggest Diamond Ever! Be sure you receive credit before you leave the area. After completing these three quests, your orphan will offer you two more quests: You Scream, I Scream... and Let's Go Fly a Kite. Accept them both and return to Stormwind City (hearth back if you can). Once back in Stormwind City, locate the Blue Recluse in the Mage District. You'll find a human vendor nearby selling a Cone of Cold—buy one. Be sure your orphan is summoned and then click on the item to share it. Next locate Craggle Wobbletop, a gnome who pushes a toy cart around the backside of the Trade District. Purchase a Dragon Kite 2-Pack, summon your orphan, then click on the item to complete the quest. TIP: Like the toy vendor in Dalaran, Craggle Wobbletop also sells a Blue Clockwork Rocket Bot. If you've yet to get one and you have the 45-50 gold, go ahead and pick one up for your collection. Your orphan will offer you a sixth and final quest: A Warden of the Alliance. Purchase a Foam Sword Rack from Craggle Wobbletop and return to Orphan Matron Nightingale, who will collect your sword rack and reward you with your choice of [Piglet's Collar], [Turtle Box], [Rat Cage], [Snail Shell], or a [Curmudgeon's Payoff] (a bag of 5 gold — for those who like telling children there's no Greatfather Winter). Before you embark upon this quest chain, you may wish to toggle your hearthstone to an Orgrimmar inn. Doing so will allow you to quickly return to Orgrimmar to complete the final quests in the series. 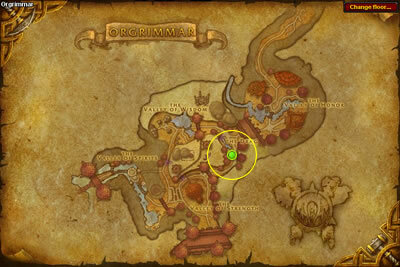 To begin this series, go to Orgrimmar and accept the quest Children's Week (level 10+) offered by Orphan Matron Battlewail (map below). You will receive an [Orcish Orphan Whistle]. Use the [Orcish Orphan Whistle] to summon your orphan. Talk to the orphan to complete the quest. Completing this quest will unlock the next three quests in the series. Accept all three. 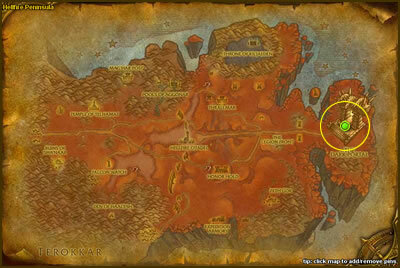 First, head northeast to Azshara and seek out the Southern Rocketway Terminus (map below). Summon your orphan to join you on a joyride around Azshara to complete the quest Ridin' the Rocketway. Be sure you receive credit before you leave the area. 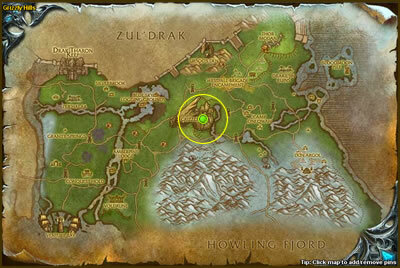 Next, fly to Thunder Bluff and make your way to Red Rocks in Mulgore (map below). Summon your orphan to complete the quest The Fallen Chieftain. Be sure you receive credit before you leave the area. When finished in Mulgore, return to Orgrimmar. From Orgrimmar, take the zepplin to Undercity in Tirisfal Glades. 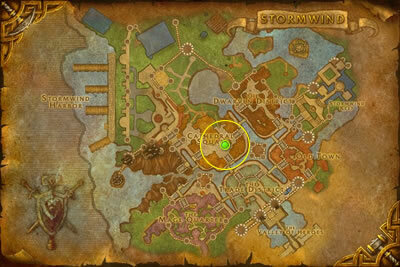 Head to the Royal Quarter to see Lady Sylvanas Windrunner (map below). Summon your orphan to complete the quest The Banshee Queen. Be sure you receive credit before you leave the area. After completing these three quests, your orphan will offer you two more quests: You Scream, I Scream... and Let's Go Fly a Kite. Accept them both and return to Orgrimmar (hearth back if you can). Once back in Orgrimmar, head to the Goblin Slums in the Valley of Strength. You'll find a goblin vendor nearby selling a Cone of Cold—buy one. Be sure your orphan is summoned and then click on the item to share it. Next locate Blax Bottlerocket, a goblin who pushes a toy cart around the Drag, passing in front of the orphan matron. Purchase a Dragon Kite 2-Pack, summon your orphan, then click on the item to complete the quest. TIP: Like the toy vendor in Dalaran, Blax Bottlerock also sells a Blue Clockwork Rocket Bot. If you've yet to get one and you have the 45-50 gold, go ahead and pick one up for your collection. Your orphan will offer you a sixth and final quest: A Warden of the Horde. Purchase a Foam Sword Rack from Blax Bottlerock and return to Orphan Matron Battlewail, who will collect your sword rack and reward you with your choice of [Piglet's Collar], [Turtle Box], [Rat Cage], [Snail Shell], or a [Curmudgeon's Payoff] (a bag of 5 gold — for those who like telling children there's no Greatfather Winter). Before you embark upon this quest chain, you may wish to toggle your hearthstone to an inn in Shattrath City. Doing so will allow you to quickly return to Shattrath to complete the final quest in the series. 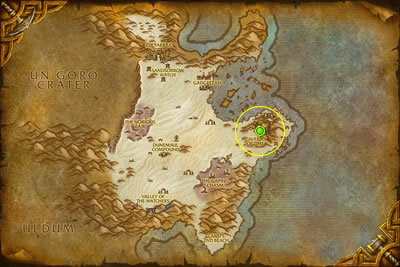 To begin this series, go to Shattrath City and accept the quest Children's Week (level 60+) offered by Orphan Matron Mercy (map below). You will receive a [Draenei Orphan Whistle]. Use the [Draenei Orphan Whistle] to summon your orphan. Talk to the orphan to complete the quest. Completing this quest will unlock the next three quests in the series. Accept all three. 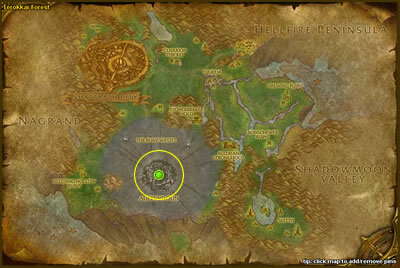 First, leave Shattrath City and head south to the center of Auchindoun (map below). Summon your orphan to complete the quest Auchindoun and the Ring of Observance. Be sure you receive credit before you leave the area. Next, go to Hellfire Penninsula and head to the Dark Portal (map below). Summon your orphan to complete the quest A Trip to the Dark Portal. Be sure you receive credit before you leave the area. 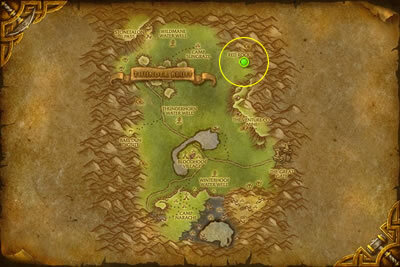 Third, go to Nagrand and head to Aeris Landing (map below). Summon your orphan and speak to Jheel to complete the quest Jheel is at Aeris Landing! Be sure you receive credit before you leave the area. After completing these three quests, your orphan will offer you a fourth quest, Time to Visit the Caverns, and a fifth quest, The Seat of the Naaru. Accept them both. Return to Azeroth and make your way to The Exodar. If you're a Druid, teleport to Moonglade and make your way from there. If not, use the portal in Shattrath to return to Stormwind and make your way from there, or seek out a mage and ask for a portal to save some time. 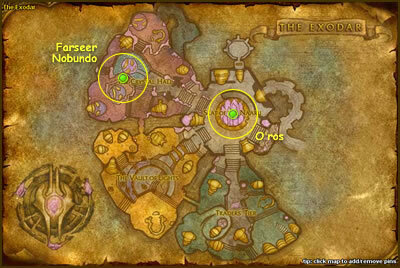 Once you've arrived, head downward within the central gallery to the bottom of the Seat of the Naru - O'ros (map below). Summon your orphan and speak to O'ros to complete the quest The Seat of the Naaru. Oro's will grant you then next quest in the series, Call on the Farseer. Remaining within the Exodar, travel west to the Crystal Hall - Farseer Nobundo (map above). Head due south of the center of the Crystal Hall, then move a bit west and northward. Nobundo is found on the second level. Speak to him to complete the quest. Next, if you are revered with The Keepers of Time, you can transport directly to The Caverns of Time in Tanaris (map below). If not, take the boat to Ruttheran Village and fly from there to Gadgetzan. Then head southeast to the entrance. Seek out Alurmi (a female blood elf) who's stationed along the cave pathway, fairly close to the central cavern. Purchase a [Toy Dragon]. Then head into the center of the central cavern. Summon your orphan in front of Zaladormu (a large bronze dragon) to complete the quest Time to Visit the Caverns. Your orphan will offer you a seventh and final quest: Back to the Orphanage. Return to Shattrath City (hearth if possible) and Orphan Matron Mercy, who will collect your orphan whistle and reward you with your choice of [Egbert's Egg], [Sleepy Willy], [Elekk Training Collar] or [Legs]. 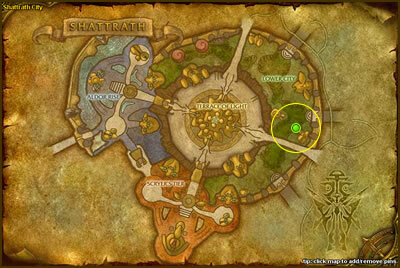 To begin this series, go to Shattrath City and accept the quest Children's Week (level 60+) offered by Orphan Matron Mercy (map below). You will receive a [Blood Elf Orphan Whistle]. Use the [Blood Elf Orphan Whistle] to summon your orphan. Talk to the orphan to complete the quest. Completing this quest will unlock the next three quests in the series. Accept all three. First, go to Hellfire Penninsula and head to the Dark Portal (map below). Summon your orphan to complete the quest A Trip to the Dark Portal. Be sure you receive credit before you leave the area. Next, go to western Zangarmarsh and head to Sporeggar (map below). Summon your orphan and speak to Hch'uu to complete the quest Hch'uu and the Mushroom People. Be sure you receive credit before you leave the area. 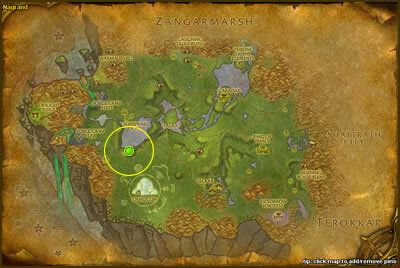 Third, go to Nagrand and head to the Throne of Elements (map below). Summon your orphan and speak to Elementalist Sharvak (a female orc) to complete the quest Visit the Throne of the Elements Be sure you receive credit before you leave the area. After completing these three quests, your orphan will offer you a fourth quest, Time to Visit the Caverns, and a fifth quest, Now, When I Grow Up.... Accept them both. Next, if you are revered with The Keepers of Time, you can transport directly to The Caverns of Time in Tanaris (map below). If not, take the portal in Silvermoon to Undercity. From there, take the zepplin to Orgrimmar, fly to Gadgetzan, and then head southeast to the Caverns of Time. Your orphan will offer you a sixth and final quest: Back to the Orphanage. Return to Shattrath City (hearth if possible) and Orphan Matron Mercy, who will collect your orphan whistle and reward you with your choice of [Egbert's Egg], [Sleepy Willy], [Elekk Training Collar] or [Legs]. Before you embark upon this quest chain, you may wish to toggle your hearthstone to an inn in Dalaran. Doing so will allow you to quickly return to Dalaran to complete the final quests in the series. TIP: Unlike other Children's Week quests, the pet rewarded by the Northrend series is determined before you begin the quests. Choose the Oracles orphan to receive the Oracle Hatchling or the Wolvar orphan to receive the Wolvar Pup. Your existing allegiance to either The Oracles or The Frenzyheart Tribe does not limit your choice. 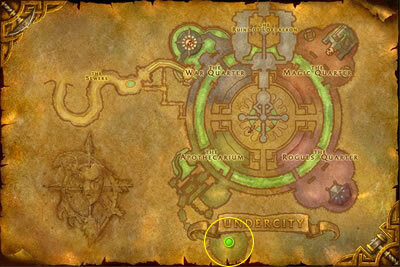 To begin this series, go to Dalaran and accept the quest Little Orphan Roo of the Oracles offered by Orphan Matron Aria (map below). You will receive an [Oracle Orphan Whistle]. Use your orphan whistle to summon your orphan. Talk to the orphan to complete the quest. Completing this quest will unlock the next three quests in the series. Accept all three. First, go to Grizzly Hills and head to Grizzlemaw (map below). Summon your orphan to complete the quest The Biggest Tree Ever! Be sure you receive credit before you leave the area. Next, go to Dragonblight and head to the Bronze Dragonshrine (map below). Summon your orphan to complete the quest The Bronze Dragonshrine. Be sure you receive credit before you leave the area. 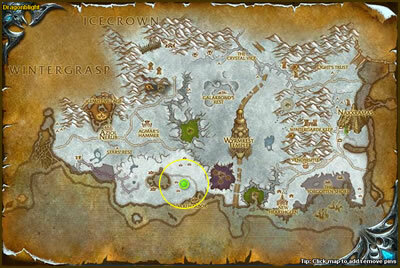 Third, go to Borean Tundra and head to Winterfin Retreat (map below). Summon your orphan to complete the quest Playmates! Be sure you receive credit before you leave the area. After completing these three quests, your orphan will offer you a fourth quest, The Dragon Queen, and a fifth quest, Meeting a Great One. Accept them both. 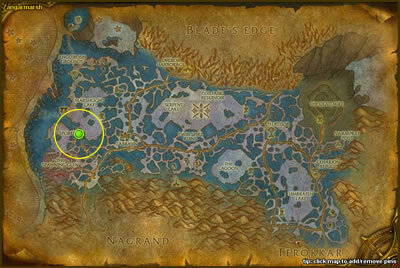 Now go to Sholazar Basin and head through the Waygate (map below) to the Shaper's Terrace. Summon your orphan near the Etymidian to complete the quest Meeting a Great One. Be sure you receive credit before you leave the area. 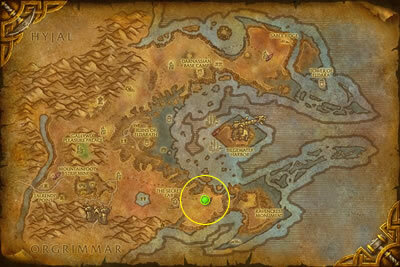 Next, return to Dragonblight and head to the top of Wyrmrest Temple (map below). Summon your orphan near Alexstrasza to complete the quest The Dragon Queen. At this point, use your hearthstone and return to Dalaran. When you arrive, head to The Wonderworks (map below). Purchase a [Small Paper Zeppelin] from Jepetto Joybuzz. Throw it to your orphan to complete the quest A Trip To The Wonderworks. Your orphan will offer you a seventh and final quest: Back to the Orphanage. Return to Orphan Matron Aria, who will collect your orphan whistle. After a few minutes, you will receive a letter from your orphan with a [Curious Oracle Hatchling] attached. To begin this series, go to Dalaran and accept the quest Little Orphan Kekek of the Wolvar offered by Orphan Matron Aria (map below). You will receive a [Wolvar Orphan Whistle]. First, go to Grizzly Hills and head to Grizzlemaw (map below). Summon your orphan to complete the quest Home of the Bear-Men. Be sure you receive credit before you leave the area. Third, head southwest to the Snowfall Glade (map below). Summon your orphan to complete the quest Playmates! Be sure you receive credit before you leave the area. After completing these three quests, your orphan will offer you a fourth quest, The Dragon Queen, and a fifth quest, The Mighty Hemet Nesingwary. Accept them both. 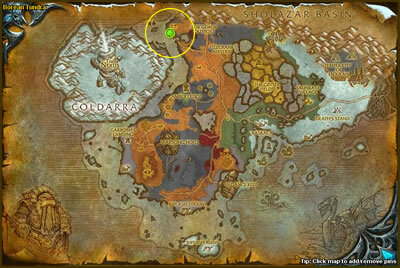 Head northeast to the top of Wyrmrest Temple (map below). Summon your orphan near Alexstrasza to complete the quest The Dragon Queen. Now go to Sholazar Basin and head to the Nessingwary Base Camp (map below). Summon your orphan near Hemet Nessingwary to complete the quest The Mighty Hemet Nesingwary. Be sure you receive credit before you leave the area. Next, use your hearthstone and return to Dalaran. When you arrive, head to The Wonderworks (map below). Purchase a [Small Paper Zeppelin] from Jepetto Joybuzz. Throw it to your orphan to complete the quest A Trip To The Wonderworks. Your orphan will offer you a seventh and final quest: Back to the Orphanage. Return to Orphan Matron Aria, who will collect your orphan whistle. After a few minutes, you will receive a letter from your orphan with a [Curious Wolvar Pup] attached. Saying goodbye is never easy. So instead say, "Until next year!" You can count on Children's Week returning next May, giving you another opportunity to sightsee with the orphans of Warcraft and, more importantly, giving you another chance to collect even more of your favorite Children's Week pets!